ARC provided by Curiosity Quills Press through NetgalleyWhile people on the surface aren't allowed - or have to possess immense power or wealth to be allowed - to have children, in the Basement, the genomes of the world's brightest are collected and used to create improved clones. They start with the omega, and perfect the following copies until they get the perfect child.The world above isn't aware of what's going on in the Basement, where these children, genetically engineered to lack aggression, sexual needs, and several other "undesired" traits, start working in the fields they were created for as soon as they turn ten.Cipher, considered a failed experiment, goes through her day-to-day life longing for the world above, but somewhat content in her work in engineering.That is, until a live feed is broadcast revealing their existence and preceding the detonation of several bombs which destroy the entire Basement, killing everyone in it... except for Cipher.Now she has to survive the world above, the media's interest in her, and the web of intrigue that surrounds her very existence.I liked Cipher. She's not whiny, she gets things done. She's upset over the ostracism she faces in the Basement on account of being considered imperfect, a failed first experiment. But she delights in her work and foregoes making an effort to fit in - she knows they'd never accept her anyway, she might as well be herself.There are some inconsistencies with the world building, especially in the Basement. Cipher tells us that:"That smell of talc and formula always made me feel strange and sad, because I knew that no one would pick up or gentle those babies until they were old enough to sit up on their own. "This seems... counter-productive. Babies need human contact to develop properly, if they don't get it they can display failure to thrive, or develop issues later. It makes no sense to genetically engineer perfect children and then not provide them with proper care.Her foster-father explains that the Basement's inhabitants "don’t have the hormones that make them want to have children of their own. "...that's dangerous. The endocrine system is complex, androgens, estrogens, and their effects, have other functions besides the ones related to sexuality.Then, of course, there is Victorious, or Tor, also created in the Basement, but his skills (he was made from the donations of a brilliant military strategist and the fittest soldier) could only be properly tested in the world above, so his mother managed to adopt him. For someone who's the son of the most brilliant military strategist, it's jarring that he's the only character in this book I could actually label as being tstl. Yes, even with the explanation to some of his more ooc actions. I also though Tor was 40-something by his description:"warm eyes, which had smile-lines fanning out from the sides""His mouth, I noted for no particular reason, was a little too wide, with deep grooves on either side. "But, as it turns out, he's 18? !Supposedly to make him closer in age to 16 year old Cipher, but still... what an odd description for an 18 year old...He's brought in to the hospital in which Cipher is recovering, being the only other person with a similar life experience.Now, Cipher had preciously told us that there were a "thousand people in the Basement, and [she] knew every one of them". This isn't far-fetched, that's the average number of students at a high school, and one can generally know everyone at least by sight, and that's without even living with them 24/7, since birth.But she doesn't know Tor at all? "“You don’t remember me, do you?” His smile faded, just a little. "Cipher seems unconcerned with this... I don't know. I wouldn't be. I found him a bit creepy, to be honest, always calling her "love" (even after she specifically told him not to call her that!) and mentioning he'd been watching her while he was in the Basement, and never forgot her, and worried about her...However, when he tells her, "You shouldn’t trust me", Cipher refreshingly goes against YA clichés and does just that. "Tor was a killer, bred, born, and trained. I wouldn’t allow myself to mistake his way of holding himself for gentleness. "She doesn't trust him. She doesn't trust anyone.She also doesn't just move on from the loss she suffered. Too often we see YA protagonists losing their parents (the missing parent trope at work!) and just moving on because they have this wonderful new ~dreamy~ boy or girl to obsess over. Cipher's losses weigh on her. She may not have been close to most of the people in the Basement other than a few - but they were all the people she'd met in her entire life. It was realistic, and a welcome change to see her grieve for them.There was a bit too much tell instead of show - Cipher's rants and monologues, for instance. But, on the whole, it was pretty good, solid writing - not so much the pacing: midway through the story it started to lag a bit.I loved Bowen and Oona - especially Oona! There were time lapses in the book and I think they did the story a disservice. The slow growth of the relationships portrayed should have been shown instead of just saying "it's been x time and now we're close". There is a sort of love triangle in this book, I personally didn't even really see it as such, because I never considered any of them to be proper love interests, so I just ignored that bit. If you hate love triangles (and who doesn't?! ), don't let that keep you from reading this book.All in all, it was an entertaining dystopia, even if it lacked a bit of urgency to it.If you're in the mood for a YA dystopia with clever protagonists and without the romantic clichés, give this book a chance! It was sooooooo good! Where's the sequel? XDI started reading the Amazon preview in order to bookmark it and COULD NOT PUT IT DOWN, so I bought it XD - because I simply could not help myself. Fortunately I started reading it early enough that I will be able to go to sleep only an hour late!! !The characters and the story were riveting. The writing was excellent, and I mean FANTASTIC.Notes: I encountered a few plot pot-holes and inconsistencies. BUT NO TYPOS, thank you, thank you oh-so-very much.On a note that has barely anything to do with anything: I really liked the cover. If you found my review helpful, check out more of my reviews atWrite.Read.Breathe This book was great, the writing style was amazing. The author did such a great job keeping me engrossed throughout the entire story. It took me a while to read because of my reading slump, but once I started reading this book I really got into and loved every minute of it. I haven't seen much craze from this book. But this is definitely worth the read, I really enjoyed it. Its written so well and the story is just so relateable. It's speaks of world after war, when the world is being controlled by the government. The government controls everything, like the things they see, the food the eat, the fact that they can't even have children. But most importantly I sympathized with Cipher, she felt so different and she was constantly being told that she didn't belong and yet all she wanted was to belong and to be loved. This book is underrated and really is a great read which I recommend everyone reads. Looks exciting. Like two of my favorite shows Orphan Black and Dark Angel. DNF @ 38%. There's nothing offensive about this book, it's just kind of bland, and I have a giant pile of other things to read. [I got a copy from the publisher through NetGalley, in exchange for an honest review. ]I quite liked this novel, though I must admit I didn't enjoy it as much as I had expected.The Basement setting and situation were intriguing, and I found the story as a whole pervaded with a feeling of oppression. It was more an impression than definite proof, but I had the nagging feeling that everyone was always being watched by someone else. Maybe because of the Feeds, maybe because Cipher remained aware that she had to watch her back at all times, and acknowledged that as soon as she'd let her guard down, it'd be the end. (And I agree she was right in thinking so! )Cipher was a likeable character, one who was aware of the problems she was in, yet tried to keep fighting, even if it meant lying low for a while. She wasn't a whiner, she kept focused on what she wanted and hoped for, and she knew how to put her coding and engineering skills to use in order to build a few backdoors. She only allowed herself to trust a handful of people, and wasn't fooled by the shiny varnish and empty promises of the Municipality. While there were hints of a potential romance too (perhaps even a triangle), she kept her priorities straight and never let herself be engulfed into that, the way too many characters unfortunately seem to do as soon as a love interest appears. Love was an important motivator for her; however, it was 'love' in a wider sense, encompassing friendship and wanting to protect the few people she held dear—not the old-as-sin trope of True Love At First Sight Forever for a boy she had just met. And she remained 'faithful' to the Basement people, to her father, even to her sisters, in that she mourned them like the people they had been, and didn't forget about them as soon as she was out, nor no matter how dire her own circumstances.I also liked the siblings: Oona for her entusiasm for gardening and living things, in a world so devoid of positive life and new births; and Bowen for being overall sympathetic, understanding, and ready to take calculated risks to get the truth out.A few things bothered me nevertheless. I expected Tor to be more... impressive when it came to planning, and the same went for Sally (deemed quite the strategist, after all). Some things are explained later when it comes to Tor, but I thought his mother wasn't so foreseeing, and it seemed a little jarring. (Minor quibble about Tor: his way of calling Cipher 'love'. It's probably just me, but I can't stand that, just like I can't stand 'babe'.) I wondered about a couple of inconsistencies, too: for instance, how come Cipher didn't remember Tor from the Basement, when she was only two years younger, and she said she knew everybody there? She was rather young at the time, yet since she remembered classes she took when she was 4-5, I would've thought she would remember him as well?At times, Cipher's thoughts also intruded too much on the narrative. They weren't useless, and contained important information, so they weren't a problem in themselves; only they tended to interrupt the flow, and made me wonder if they wouldn't have been better included elsewhere.I wished Bowen and Oona had been given more importance, probably because of The Truth (the unauthorised Feed they broadcast in the beginning): the latter looked like a useful tool, able to ignite a lot of things, yet it just went away, and the siblings became more and more like 'people to protect', and not 'people who mattered thanks to their actions'. (Perhaps I also slightly resented how Oona was important due to (view spoiler)[her pregnancy (hide spoiler)]; it made sense within the context of that specific world, but I tend to find such things annoying. As a woman, I'm not at ease with the idea that what makes me important is (view spoiler)[my ability to have children (hide spoiler)]; I want to believe we're much more than that. This is however a very personal observation, and I doubt it'll be a problem for every reader. )In general, I liked this novel, and if there were to be a next installment—the ending kind of begs for one, especially now that (view spoiler)[Metis (hide spoiler)] has appeared—I'd probably want to read it. I just can't push myself to give it more than 3 stars. 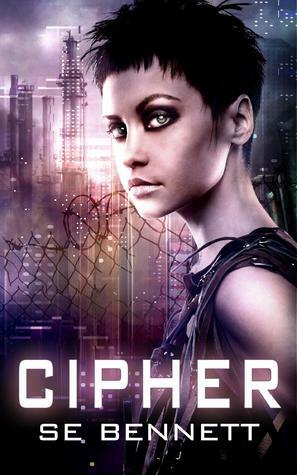 http://a-reader-lives-a-thousand-live...Title: Cipher Author: SE Bennett From: Netgalley Genre: Dystopia Release Date: 14th March 2014Challenges: 2016 Netgalley & Edelweiss Challenge,2016 Blogger ShameLinks: Goodreads - Amazon Synopsis (from Goodreads): Cipher Omega is a failed experiment, an identical clone of the brilliant, damaged woman whose genome the scientists of the Basement were trying to copy and improve. All her life she has dreamt of life outside the laboratory, on the surface world, but when her home is destroyed and she’s left the only survivor of a hundred-year human cloning project, she is forced to face the reality of the military-ruled nation that created her. Aided by the only other surviving child of the Basement, an enigmatic solider named Tor, and two rebel freedom fighters named Bowen and Oona Rivers, Cipher finds herself searching for answers, at any cost.Cipher was a good read, it was fast paced and I really got the message about what actually makes you human that seemed to be running through it. The first chapter was actually an event from near the end of the book, and it had me intrigued from the start, and then even more so when odd events happened compared to what I knew about that. The technique was also used a little bit within chapters too. It was easy to remember that Cipher was only 16, but that was tempered with a slightly more mature outlook based on the fact that she'd been through so much grief, as well as a non-childhood. As a clone she was kept hidden from the world in general and that meant that she was brought up in a more sterile environment. However, Cipher's biggest flaw in the eyes of her creators is that she is capable of loving and wants affection. This led to the friendships and bonds that she formed throughout the book and what I really liked about her characterisation is that she didn't just forget about the people she'd left behind, they were part of the reason she'd carried on in the first place. I also felt like she actually grieved, whereas a lot of authors seem to skip over some of that. I wasn't sure what to make of the love triangle. Now don't get me wrong it isn't a major part of the plot, but it was clear early on that Cipher was at least a little interested in two different characters. I wasn't too sure about the resolution of this, but the ending is definitely written as if there could be more to the series, so I'm happy to keep an open mind about it. Bowen, Oona and Tor were all great side characters, and complex in their own ways. They had their own varying motivations and they seemed to stick to what they believed. I liked that they weren't one dimensional and they were about more than just helping move Cipher along as a character. This was an interesting read, and kept me engaged from beginning to end! (I received a free copy of this book from Curiosity Quills in exchange for a review). (This review may contain spoilers).I was a bit surprised by how much I enjoyed this book. Young adult books can sometimes be a bit hit and miss with me, but this one definitely succeeded in holding my attention.Cipher was a character I found really easy to identify with. I'm quite happy to read books written in the first person, but most of the time, the first-person character changes. I was... really glad that didn't happen here.The storyline of this book was really intriguing and was enough to keep me reading throughout. It was really good to read a book about clones - they're not something that feature too much and although Cipher was a unique character, it wasn't in a way that made her an irritating heroine.I have mixed feelings about the love triangle here. As a rule, I have gone off love triangles. However, this was one time I felt it had been done in a particularly good way. I liked both of the males and even by the end, I wasn't sure who I was rooting for Cipher to end up with.I do think that periods of time were skipped over a bit too much. There were some things that I would have liked to see develop - like the relationships between the characters.I didn't have a particular favourite character, except perhaps for Oona. The main characters came across as real, realistic people, with strengths and weaknesses that made sense. The first scene was enough to drag me into the book and as the events progressed, I kept reading. I could experience how Cipher felt along with her.The writing was very good and I could picture a lot of the events happening in my mind. The ending wasn't exactly satisfying, so I'm hoping there will be at least a sequel to this - I think there's so much more of the story that could be explored.I would definitely be interested in reading more books by this author in the future. If you're looking for a young adult book that doesn't have vampires, demons, angels or witches in it, this is more realistic science fiction. I received a copy of this book from Netgalley (and Curiosity Quills) in exchange for an honest review.I was immediately drawn in by the book synopsis and was excited to read the book. I was especially eager because I have thoroughly enjoyed everything that curiosity quills has given me the privilege of reading/reviewing so far. As soon as I started reading, I was engaged with the character and the story. I'm a sucker for books that hook me fast, and this book managed to keep me interested the whole way through. I started reading less than 24 hours ago as I write this review, and aside from a brief pause here and there for sleep or hygiene, I read straight through to the end. There were one or two things about the writing that rubbed me the wrong way (mostly word choices, really) but other than that I really liked reading about this world and these characters. I would very much like to read more! I will be waiting and hoping that another installment comes out, because I think these characters will be stuck in my head for a while. I'm always impressed by young writers - where did they find the time and motivation? Though the YA market is saturated with dystopian novels, this one does have a fresh take. I enjoyed the premise - Cipher, a 16 year old clone, was created in "the Basement". She has never been above ground and knows she's different from the other clones. She has emotions, and while a genius, she struggles with things that her fellow basement clones do with ease. Yet, it is her differences that ultimately aid her when her world is turned upside down. We have a strong heroine who is not afraid to stand up for herself and an interesting set of supporting characters (go Team Tor!). My only critiques are that for a smart girl, Cipher certainly has some dumb moments, and some of the sci fi stuff at times is a bit overdone and becomes a bit of a get-out-of-jail-free card. Overall, however, an enjoyable read. In general, I liked this novel. It was a page-turning mystery who needed to be solved. Who was Cipher cloned from? What is the Municipality really about? It made me reading the book faster than usual. Cipher is a likeable character, one who is aware of the problems she’s in and keeps fighting. The storyline was really great, but I have really mixed feelings about the love triangle. I have gone off love triangles as a rule, I believe. They are everywhere, in any story and it's just ... I am a little tired of it. But otherwise it was a really good story! I like the idea for this book of a futuristic society that controls births and is secretly cloning smart people. I'm not sure it really lived up to what I thought it could. It was not poorly written or developed, I just didn't really make a connection with Cipher, the main character. I was not bad, but not spectacular.I received this for free through NetGalley in return for an honest review. Cipher was a very good read. You are quickly drawn into the character and her predicament. The characters have flaws and are realistic, even as you're wishing they'd just speak up sometimes. It's a unique and interesting plot, with twists and uncertainties. It was a good read and I would definitely be interested in reading more of this series. Cipher Omega was created, born, and raised in the Basement. Now she is above-ground and fighting to learn and survive. Who is she cloned from? What is the Municipality really about?A fast-paced, action-packed narrative leads characters and readers through the mysteries of this world. Characters are varied, mysterious, and intriguing.Overall, an exciting read. I received a copy of this free from Netgalley in return for a review! I really enjoyed this book, there were loads of twists and turns that I didn't see coming! The main character was great and really relatable.I hope that I get to read more from this author soon! Plus I love the cover! Cipher is a well written and thought out story. It reminded me of Ender's Game with its dealing with attempting to mold young genius's for other peoples uses and of The Hunger Games with the minority elite dominating the population and willing to go to extremes to stay there. I enjoyed it. I won this in a goodreads giveaway. Took me a while to get into it, but glad I did. great read!! S.E. Bennett - SE Bennett is a biology student from London with an inability to stop writing stories during genetics lectures. She grew up in the desert in Africa, where she read everything and anything she could get her hands on, and she is passionate about inspiring young people to love science and explosions as much as she does. Her debut novel, Cipher, is published by Curiosity Quills.